Last week, 5pb. announced a new Steins;Gate game and anime are in the works. 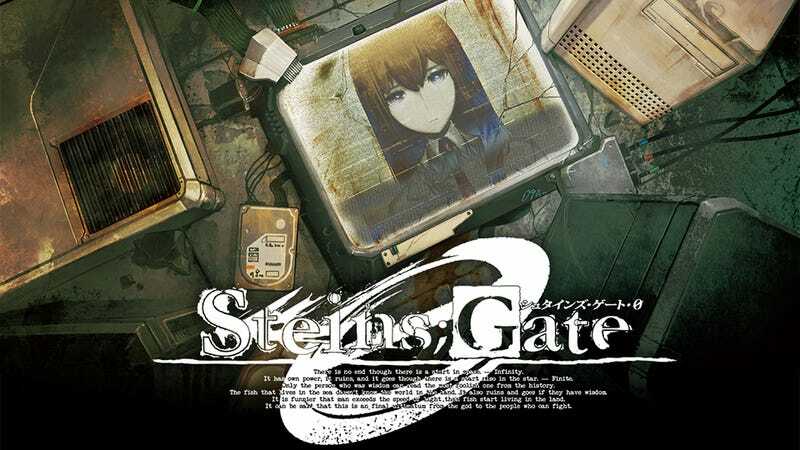 And while there have been spin-offs and fandiscs to Steins;Gate previously, Steins;Gate 0 is the first to be touted as a vital part of the main story. The original Steins;Gate is a phenomenal visual novel—and the subsequent anime adaptation is, quite honestly, the best anime I have ever seen. Focusing on the ramifications of time travel, it follows Okabe, the creator of time travel, as he attempts to undo the damage his invention has caused and save the life of his best friend Mayuri. Steins;Gate 0, interestingly enough, appears to be neither prequel nor sequel to Steins:Gate. Rather it looks to be a midquel of sorts, taking place just before the original game’s true ending. In Steins;Gate, Okabe returns to the Beta worldline—the world where he does not invent time travel. But while this prevents a distopia and saves Mayuri’s life, it is a timeline where the woman he fell in love with over his time travel adventures, Kurisu, has already died. At the moment of his greatest victory—and deepest sadness—a time machine from the future appears and gives him a chance to save Kurisu. However, as Kurisu’s death is the focal point of the Beta worldline, she is fated to die. So in the process of trying to save her, he kills her himself by accident. A broken man, he returns to the present. The game then continues with Okabe receiving a message from his future self, explaining that Okabe had to fail at saving Kurisu so that he (future Okabe) would be created and be able to spend his life figuring out how to create a world where both Kurisu and Mayuri survive. He then convinces his past self to try to save her once more—which leads to the game’s true ending. Steins;Gate 0 is the story of the future Okabe—the Okabe that killed Kurisu and eventually dedicated his life to finding the perfect worldline, the Steins;Gate. What’s interesting is that this story has already been told in light novel and manga form. The Epigraph Trilogy (Steins;Gate: Epigraph of the Closed Curve, Steins;Gate: Pandora of Eternal Return, and Steins;Gate: Altair at the Apoapsis of Infinity) follows the life of future Okabe. Suffering from severe PTSD after his failure to save Kurisu, Okabe attempts to become a normal student. At a scientific conference, he meets Maho Hiyajo. This young genius in the field of neuroscience is working on “Amadeus”—a program that allows a person to make a digital copy of his or her brain which then becomes an AI avatar of the person. Soon Okabe discovers that Amadeus is the project Kurisu was working on before her death and—even more shocking—Maho has a copy of Kurisu’s brain from just before she left for Japan. While Steins;Gate 0 will have its own original scenario apart from the Epigraph Trilogy, the game’s first trailer shows that Maho, the Amadeus program, and virtual Kurisu will all show up in some form or fashion. Everything else, besides the basic plot about future Okabe, however, could be completely different. Nonetheless, this is more than enough to whet my, or any Steins;Gate fan’s, appetite.